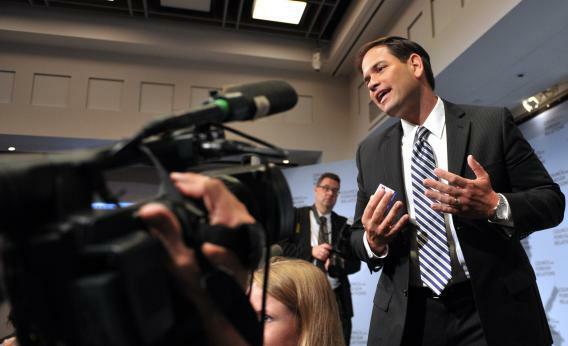 US Senator Marco Rubio, R-FL, leaves the stage just after speaking at the Council on Foreign Relations May 31, 2012 in New York. Obama’s new immigration policy is favored 2-to-1 by the public, including a healthy majority of independent voters. New York Sen. Chuck Schumer is trying to win back Wall Street cash for the Democratic Party. Mark Blumenthal says Gallup polling might be skewed against Dems. The University of Virginia has appointed an interim president as the uproar over the ouster of President Teresa Sullivan continues. Labor has a big online ad buy targeting Democratic Senator Sherrod Brown’s challenger, Josh Mandel, for shady campaign contributions in Ohio. And Marco Rubio apparently isn’t being vetted by the Romney VP search team.